Magazines come and go. They are a dime a dozen. But when a magazine endures the test of time and reaches the big SILVER mark, then that is a milestone worthy of a big celebration. 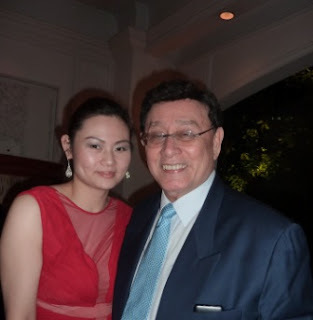 Lifestyle Asia Magazine, was started by Ezequiel Garcia in 1987 with Ting Ting Cojuangco on the cover of its maiden issue. In 2002, it changed hands and taken over by the Mega Publishing Group with Liza Ilarde as its first EIC. Sari V. Yap was its next EIC in 2003 until 2007 when Anna Sobrepena assumed the post and brought the magazine to the next level. To date, Lifestyle Asia remains the country's longest running glossy and has for over the last five consecutive years, ranked number one in the luxury magazine category, according to the results of independent study by the Singapore based Synovate Report. "It is a tribute to those who brought Lifestyle Asia to where it is today and to a reading public who subscribed to nothing less than living at its finest", as I quote Anna Sobrena during her speech. It was a well attended event, with Manila's luminous elite attending. Moet et Chandon and other wines overflowed like there was no tomorrow, Olga Asercon made sure of this. Charlene Cobanquiat Tiu and Oh Yes, it's Johnny! Amparito Lhuillier, elegant mom of designer Monique Lhuillier, strikes a pose with Grand Belle Resources Chairman of the board, the suave and dapper Willie Osier.